With market share averaging in the stratospheric 85 to 90 percent range, Double Data Rate 3 (DDR3) modules will remain the dominant technology in the dynamic access random memory (DRAM) market for 2011 and at least three more years before it cedes ground to a faster, next-generation version, according to new IHS iSuppli (NYSE: IHS) research. DDR3 in 2011 is projected to account for 89 percent of the 808 million DRAM module units shipped this year, up from 67 percent last year and 24 percent in 2009. In comparison, the older and slower DDR2 will make up 9 percent of the module market in 2011, down from 29 percent last year. The legacy-type product of DDR will take up the remaining module shipments in the market. Modules are packages containing DRAM chips for use in PCs and other electronic products. With plenty of life left in it, DDR3 will see its share of DRAM module shipments actually rise during the next two years—to 92 percent in 2012 and to 94 percent the year after—before it heads down an irreversible cycle of decline that starts in 2014. That year, DDR4, which handles data at a much faster speed than DDR3 and whose standards are in the process of being finalized, is expected to make its first substantial presence in the market, immediately garnering about 12 percent share. By 2015, the tables will have turned, with DDR4 modules taking a majority share of market at 56 percent, compared to 42 percent for DDR3, out of total DRAM module shipments of approximately 1.1 billion units, as shown in the figure below. While erstwhile leader DDR2 remained at the pinnacle of the DRAM module market for approximately four years, DDR3 will enjoy a run a the top for a total of five, starting from 2010 until its projected end as the dominant force by 2014. 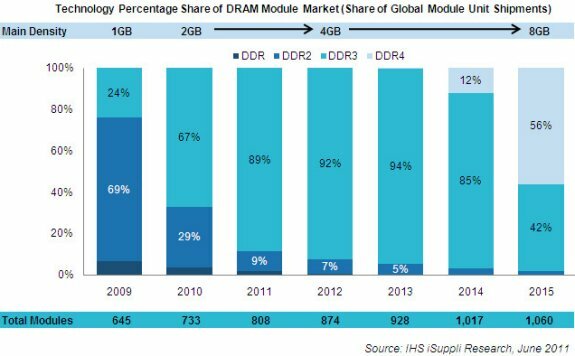 By then, the main densities of DRAM modules also will have shifted from 1 gigabyte (GB) in 2009 to 8 GB in 2015, IHS iSuppli research shows. With DRAM technology stabilizing for the time being, a new module form factor appears ready to make an initial foray into the higher-performance world of server computers. Load-reduced Dual In-line Memory Modules (LRDIMM), mainly in the form of higher densities at 16 GB and up, are set to vastly increase the memory capabilities of high-capacity computing workhorses such as enterprise servers and mainframe computers. LRDIMMs will combat the problems associated with signal integrity degradation and hampered performance that start to occur at very high memory densities, with LRDIMMs allowing continued loading and increases in megabyte capacity on specialty systems. Not compatible with older systems, LRDIMMs will only begin shipping as new computer systems are procured, appearing in the second quarter.